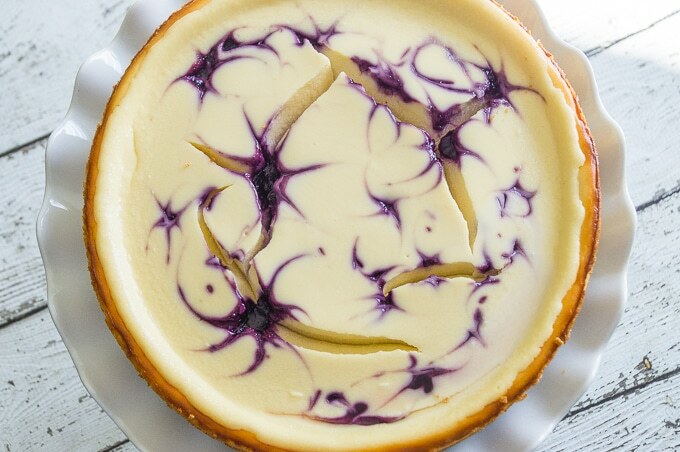 This Blueberry Swirl Cheesecake recipe is out of this world delicious – creamy, velvety-smooth bliss. And it’s more than pretty enough to impress friends with at your next potluck (tell them you’ve got the baked cheesecake dessert handled)! 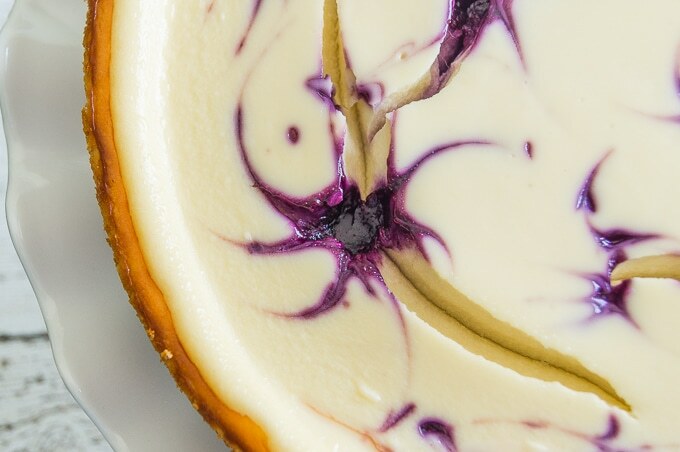 This Blueberry Swirl Cheesecake is one of those simple back-pocket recipes you need to know. It uses a simple graham cracker crust, with deliciously easy baked cheesecake, and a blueberry compote that’s ever so slightly more refined, thanks to the addition of a secret acidic ingredient. Balsamic vinegar is my secret ingredient. Also, also, also. 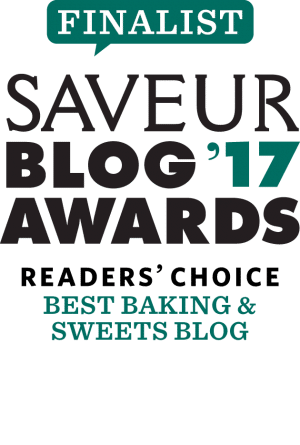 If baked cheesecake recipes are your thing, you will definitely want to check out my Chocolate-Covered Raspberry Cheesecake. If you’re short on time, and want another option, take a look at these No Bake Oreo Cheesecake Bars. How to prevent cracks in cheesecake? Cracks in cheesecake are a fairly common occurrence. I typically don’t worry about them, and they certainly don’t turn your cheesecake into a “bad cheesecake”. When taking photos of this recipe, I had a few big cracks…I just filled them in with some yummy blueberry compote when serving. But you’re not me. And in case you feel like your life would be completely and utterly void of meaning if your cheesecake has cracks in it, here are a few tips to that will help make sure your cheesecake doesn’t look like a 3D topographic map of the Grand Canyon. Be careful not to overcook your cheesecake. This is the most common reason for cheesecake cracks! When you remove your cheesecake from the oven, the sides should be slightly puffed, but there should still be a jiggly wiggly bit in the middle. Don’t open your oven door while baking. I know, I know…you’re dying to get a whiff of that freshly baked blueberry cheesecake. Well, you can’t. Opening the oven door basically creates temperature changes and drafts of cool air resulting in big cracks. Let it cool gradually. The more gradual the better. If you have time to turn off the oven and let it cool in there (with the door slightly open) for an hour, it’s not a bad idea to let it do so. Run a knife around the edges of your baking dish to ensure your cheesecake doesn’t stick to the side while it cools. 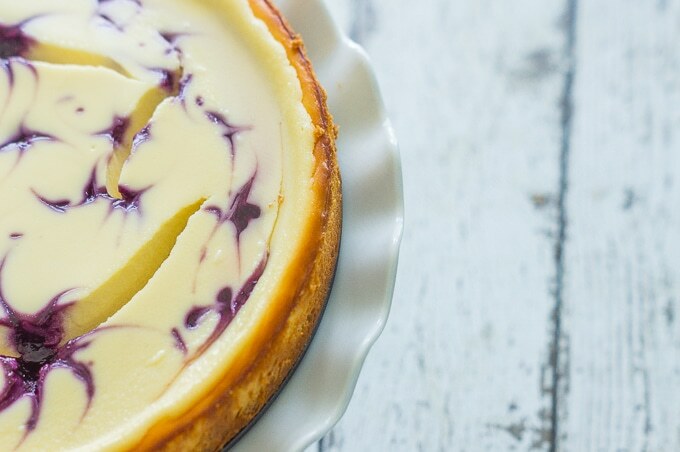 There’s a fairly simple, albeit not-100% perfect method to fixing cracks in your cheesecake. Make sure you only try to fix the cracks once your cheesecake has cooled and been properly chilled. Simply warm an offset spatula (you can do this by dipping it in hot water and then wiping it off; or by gently warming it over a hot element), lightly press down by the cheesecake crack and spread that part of the cheesecake so it fills in the crack. Make sure to be gentle, and make sure to re-chill the cheesecake so that the covered crack sets as well. Though it’s simple and mostly effective, I’m personally not a massive fan of this method. I prefer to just to hide the crack using sour cream, or fresh fruits, or a compote. Hey, bestie! The links below are affiliate links. This means that should you choose to buy from them, I will receive a small commission at no extra charge to you. And I’d be super duper grateful. Thank you. A leak proof 10-inch springform pan is the way to go with this recipe. A good mixer, such as this KitchenAid 7-speed hand mixer will make life a lot easier. So…did you release your inner Jackson Pollack? 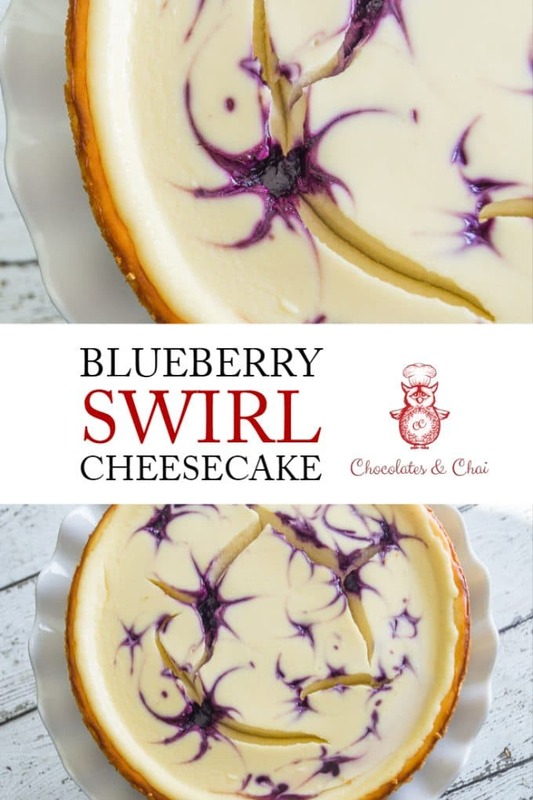 I’d love to know what you thought of this Blueberry Swirl Cheesecake recipe. Drop me a line in the comments if you tried it or have any questions. Don’t forget to follow me on Facebook, Pinterest, Instagram, and Twitter. Or just sign up to be a part of my mailing list. That way you’ll know whenever I publish a new recipe! This rich, velvety-smooth Blueberry Swirl Cheesecake is sure to impress. Simple to make, delicious to eat! Preheat oven to 350 degrees F. Butter a 10-inch spring form baking pan. Using a small pan, mix blueberries, sugar, and balsamic vinegar over medium heat until the berries begin to break down (about 5 minutes, stirring occasionally). Combine water with cornstarch until smooth and mix into blueberry mixture. Allow the compote to reduce to your desired consistency over a medium-high heat before setting it aside to cool. Mix together sugar, crumbs, and melted butter. Press the crumb mixture into the bottom of your baking pan. And smooth using the back of a spoon. Bake for 10 minutes. Set aside to cool. Beat together cream cheese and sugar. Once smooth, mix in sour cream, flour, and vanilla until combined. Add the eggs one at a time and mix gently (on a low speed if you’re using an electrical mixer) until just combined. Pour the filling over the baked crust. 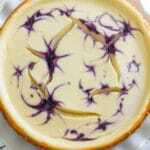 To decorate – plop a few tablespoons of the blueberry compote on different parts of the cheesecake and use a toothpick to swirl a pattern into existence. You can be as intricate (or not) as you want. Release your inner artiste! Bake for 40-45 minutes until the outside is set, but the centre remains slightly wobbly. Remove from oven and set aside to cool. Run a knife around the edge. Cover with clingfilm and refrigerate for at least 4 hours (ideally, overnight). Best served cold, with the leftover blueberry compote. Enjoy! Pro Tip: Before the final baking of the cheesecake, make sure to tap the mixture gently on a steady table a few times. This will help air bubbles rise to the top to reduce cracking. Pro Tip 2: If you do get cracks, you can fill them with compote once the cheesecake has been refrigerated. That way it looks like you planned them all along! Far-from-Pro Hack: Bake using a water bath. If you don’t have a dish large enough to use as a water bath, I find that having a large dish of hot water in the oven rack below your cheesecake still helps. Hey Sabrina! Thank you so much for saying so! My favourite cheesecake flavour! Recipe looks divine – pinning this recipe for sure! Hey Jessica! Thanks so much! This is one of my favourite cheesecakes too! I absolitely agree with you that full-fat everything is a must when making Cheesecakes, Riz. 😋. 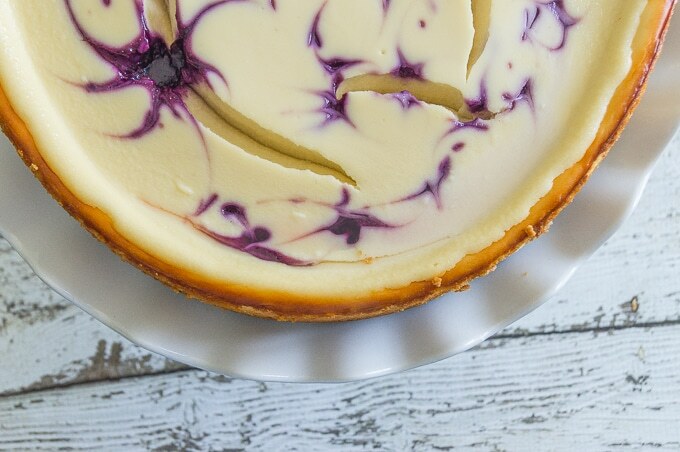 Your Blueberry Swirl Cheesecake sounds (and looks) delicious. Cracks are common and your tips are great. I find lining the sides of my springform pan with a strip of parchment really helps – as the cheesecake cools and shrinks, it adheres and shrinks to the parchment nicely and is easy to peel away once chilled, rewarding you with really clean edges. 💗. Thank you for sharing another terrific recipe. It is always a pleasure to read your posts. Thank you so much, Denise! And that’s such a great tip! Lining the sides of your pan is an awesome way to go, I totally forgot about because I’m usually too lazy to nicely cut out my parchment paper 😛 But you’re so right, that’s a great way to get lovely clean edges! I don’t think I’ve ever made a baked cheesecake without cracks! Great tips for preventing and fixing! And I love the blueberry swirls! Thanks Leanne! I’d say I’ve had about a 50/50 rate for baking cheesecakes without cracks. They’ve never bothered me much though. And thank you! I had fun making the blueberry swirls! What a gorgeous cheesecake, cracks and all! Also, I love the addition of balsamic to give the blueberry swirl a little extra pop. Sounds like the perfect ending for my next dinner party. Hey Isabelle! Yes! the balsamic vinegar just brings out that little bit more flavour! Fantastic looking cheesecake! I’m going to send this to my mother because she loves baking cheesecake, (and is quite good at it) but hates when they crack! I know she will love this recipe and it’s baking tips. By the way, I made your fluffy pancakes the other night….simply fantastic. They turned out perfect! Hey Markus!! That’s amazing, thank you so much for passing the recipe on to your mother! I hope she loves it!